Hi guys, Today we are back with an another post on how to download Bluestacks on your PC. In this article, we are going to provide full information about Bluestacks, System requirements and Direct download link to Bluestacks. Bluestacks download is available for all the Windows 10, Windows 8.1, Windows 7 Computers. This App is the most used Android emulator among all the emulators. Bluestacks is an android app player which allows you to run Android apps on your computer. Android emulator acts as the bridge between the Android and Desktop by enabling them to run Android apps on Windows and Mac computers. Bluestacks also allows you to run 90% Android App in your Windows and Mac PC. If you are an Android freak and wants to use Root apps, but you can’t root your mobile phone, then you can download Bluestacks for PC. You can also use Install Bluestacks tweaker to Change android id, IMEI of the Bluestacks. If you are fond of android apps, games and wants to use run them on the large screen then Bluestacks is the best option. If you think that Bluestacks slows your computer, then you are wrong because recently the Creators has Updated 1.0 to Bluestacks v2.0 and came up with some speed improvements and completely new user-friendly UI. In case, if you any doubts regarding whether Blustacks will run or not then you can check system requirement below. Below link is the direct link to download Bluestacks and Before downloading from the link you can check the Software information and version of the Bluestacks. Step 1. Download Bluestacks App Player directly from the above link. Step 2. Now you download process will start and it will take some time to Complete as the file size is around 300mb. Step 5. 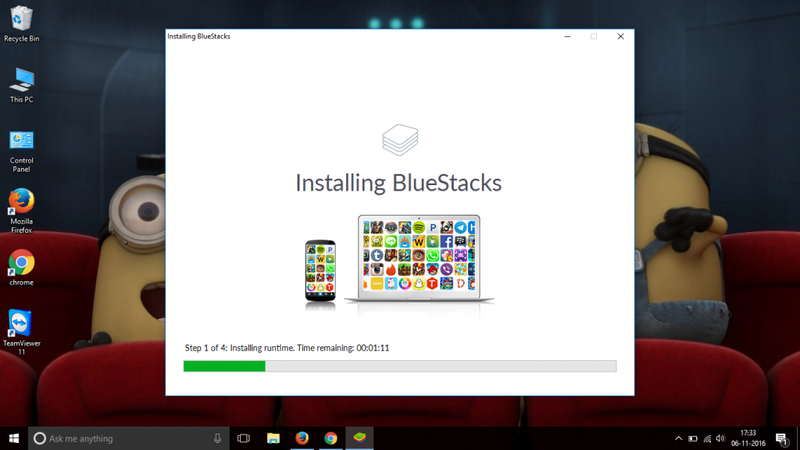 Now follow the on Screen instructions to Install on Bluestacks on your pc.